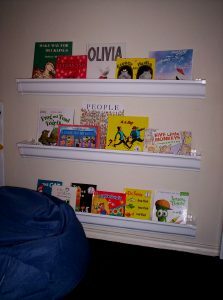 Best Shelves for Displaying Kids’ Books: Kids generally can judge a book by its cover. The Burning Daylight Series remains on hiatus because I am frantically unpacking hundreds of boxes. This is fine because my children have managed to burn their very own daylight without instruction by creating an elaborate ‘Box Town‘ in our box filled living room. 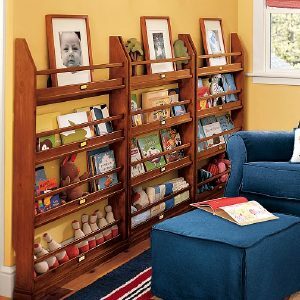 Which is riveting of course but I thought today we’d discuss easy access book storage for kids, inspired by this post at Apartment Therapy: The Nursery and the comments on that post. Kids are visual little people and, especially before they can read, a book’s cover art is what draws them in. Bookcases which hold the books facing out are therefore perfect for kid’s bedrooms, playrooms and kid-friendly rooms in general. 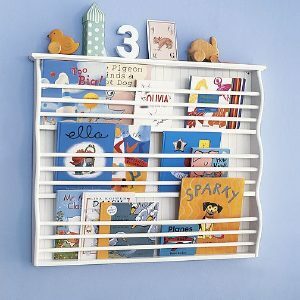 Like Apartment Therapy my personal favorite is this tall book rack from Pottery Barn kids. I love how the unit doesn’t take up a lot of floor space, has plenty of room for books and other small toys and most exciting: you can label the shelves. Pottery barn also offers the Catalina wall hanging book rack, which takes up even less floor space, just about none. It’s also just $99. I can’t help but look at it though and wonder how easy it would be to make something similar. Martha thought so too, here’s a reasonably simple looking tutorial for making your own. My daughter likes to read 3-5 chapter books at a time, all of which end up in a precarious pile on the nightstand next to her bed. Add the required lamp, clock, lip balm and water and you have a frustrating mess. 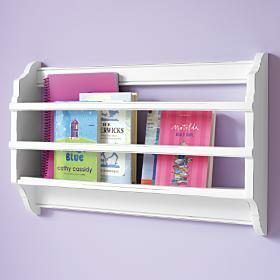 This shelf at The Land Of Nod would be an excellent solution attached to the wall next to a bed or in a reading nook. 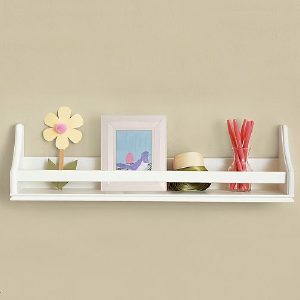 Similarly this Collector’s Shelf from Pottery Barn would be excellent next to a bed and an even better solution for bunk beds, no more books dropping from above or eyeballs being poked out from co-sleeping books. I know it’s a little redundant to tsk-tsk at price, but wow, that’s a bit steep. It seems if you found a display shelf at the craft store, flipped it over and added a dowel or other piece of wood you’d have the same thing for a fraction of the cost. Of course, then there’s the question: ‘But will you?’ If the answer is no, check out this Etsy seller’s version at just $15. Another neat DIY idea can be found at duanecoBlogs, rain gutters. Inspired after seeing this idea at the Chattanooga Children’s Museum, this father of two recreated them at home for $35. My husband thought they’d look good painted to match your walls, but I like the crown moulding look of the white. In our new house so far I’m displaying books in the family room in a basket since we lost our built in bookshelves. So far it seems to be drawing in my kids, one is sitting on the floor reading as I type. I also use this antique trug to store books in my son’s room upstairs. I found this piece at the flea market years ago and have never been quite sure what to do with it, this seems to be the best use I’ve come up with. I’ve considered painting it and maybe shining up the copper cladding on the upper corners but somehow feel bad disrupting it’s finish, although it’s probably not original. 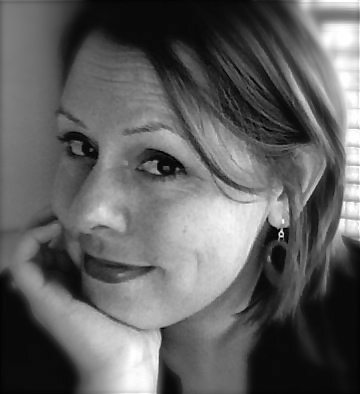 How do you make books accessible to your kids at home? We have tons of Christmas themed books that I pull out every year. I place them in a basket near the tree. The kids love to read them in the “glow” of the tree. There’s something special about books you are allowed to read only a few weeks out of the year. Denise, we do that too. It’s one of the things I don’t love about cable and dvds, the excitement of having access to certain movies and specials only some of the year. So exciting. Abiyoyo! That’s my kid’s favorite book. I’m not as fond of it, mostly because Max announced one morning that I had stinkin’ feet and matted hair. You know what kid, I know. I’m working on it. We just have bookcases in every room, and piles of books on most surfaces, and it seems to work for us. I’m raising a reading addict here. Oh, and I’m so happy to see you have Mr. Lunch – awesome books!! The pictures blow me away with their coolness. We just went crazy at Ikea when we moved into our condo. We bought, let’s see, four of those expedit bookcases in different sizes and distributed them throughout the house. They were cheap and people can’t believe that we got them from Ikea. I like that they aren’t toally book-specific. We use them for toys in the baby’s room too. I do want to get one of those book racks for the baby’s picture books. This browser box is spendy, but very well-made and sturdy. It holds books and small toys in the living room. Play room books are in baskets on the floors, and bedroom books are on a plain old bookshelf. I will have to try organizing them by color. I also bought the Expedit bookcase from IKEA. They hold an amazing amount of stuff. I especially like that those really tall books fit in them. I love love love the rain gutter idea! I must do that in my skinny hallway. Congrats on the new house (and super-congrats on selling the old one)! We bought two of these a while back. LOVE them. I also have two trugs in my sons room. And one of the sling bookshelves. He has a lot of books. I LOVE the shelving books by color idea. My mom is a teacher, and is currently looking for decorating ideas for her office. I can’t wait to suggest this.